For the last five years we have arranged a social at our local pub to get all our current members, coaches, committee members and our new students together. The aim is simple, the new people come and see what they are letting themselves in for, and the rest of us get to meet the new people we'll be coaching and paddling with over the next year and beyond. Everyone was on their best behaviour. The polite conversation in the beer garden soon moved inside as only Simon in his t-shirt couldn't feel the wind or light rain. Once inside, and fully thawed, we got down to business...having a catch up with other members, welcoming the new students, answering questions and making sure everyone was looking forward to getting on the water. Oh, and we also drank a few jars of the good stuff. 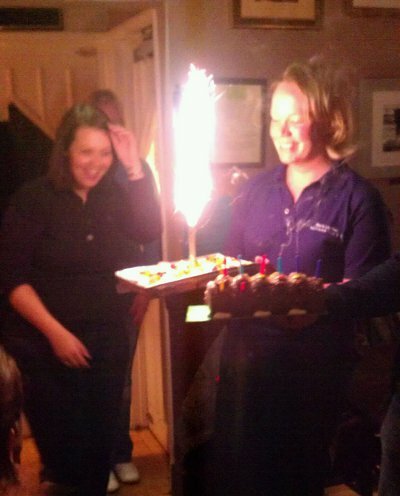 This year's social took a slightly different turn though because it was Rach's birthday. After a slow start we moved on to the celebrations which consisted of two cakes, the birthday song (thanks James Brown), indoor fireworks and the drinking paddle. We all scoffed cake and had a grand time. Apparently a few stragglers stayed until closing...good show! We hope we haven't put too many of you off! A huge thanks to the staff at the Prince of Wales, not least for supplying us with the indoor fireworks!